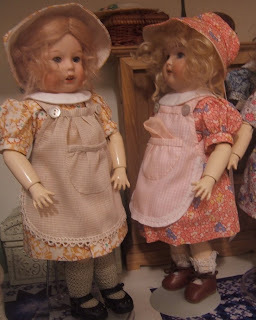 In the GL catalog there were many dresses styled with like my E-Pattern.These dresses featured a v-shaped yoke, pleated bodice, pleated shirt, puffed sleeves with band, fabric belt and various collars. There was a sunbonnet also that came with the dresses. In the 1946 issue of LSDS there was a wonderful little dress, almost like the Fenaison, but with two velvet bows at the waist. Throughout the 40's and 50's there were many dresses which could be reproduced using this pattern. I call them School dresses since they are such nice and neat and colorful little dresses that would be wonderful for school days! I fell in love with these dresses. Most used fabrics with nostalgic prints or flowers and checks with bright colors. 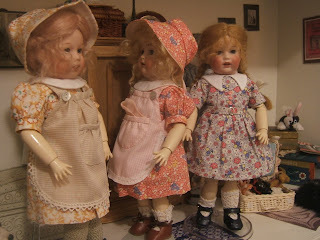 I have a large collection of Reproduction fabrics that are scaled perfectly for the Bleuette dolls. I am offering many of these Reproduction Fabrics in kits. Fenaison E-Pattern. (Deduct $10.00 from kit if you already have this pattern) I am also including my free pattern for the 1952 Gare aux taches, Beware of Spills Apron, which is featured in Bleuette by billyboy* over one of the Fenaison or School Dress styles. Supplies and Materials: Reproduction fabric for dress and bonnet, material for collar, belt buckle, buttons, and snaps. For Apron: fabric, lace, snaps, and buttons. Everything you need to sew up a wonderful little school dress and bonnet with an apron to match!